* It even works under the most restricted user accounts: if the rights of the user running Utilu Silent Setup for Mozilla Firefox are not sufficient enough Firefox won't be installed, but only extracted to a temporary directory. Because the website(s) are opened directly, the user won't notice the difference. 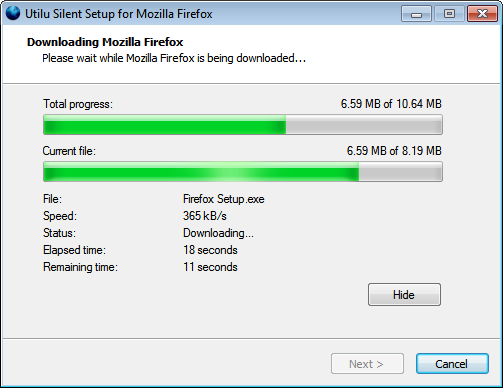 * Utilu Silent Setup for Mozilla Firefox is een klein meertalig hulpprogramma ontwikkeld door Utilu dat na goedkeuring volautomatisch de meest recente versie van Mozilla Firefox voor het gebruikte besturingssysteem kan downloaden en installeren, om er vervolgens direct of meerdere websites in te openen. Qweas is providing links to Utilu Silent Setup for Mozilla Firefox 1.0.2.3 as a courtesy, and makes no representations regarding Utilu Silent Setup for Mozilla Firefox or any other applications or any information related thereto. Any questions, complaints or claims regarding this application Utilu Silent Setup for Mozilla Firefox 1.0.2.3 must be directed to the appropriate software vendor. You may click the publisher link of Utilu Silent Setup for Mozilla Firefox on the top of this page to get more details about the vendor.